With our four node Knight’s Landing system in the lab, we wanted to take a quick look at Intel’s LGA 3647 socket. This is Intel’s next-generation socket that will replace the venerable LGA 2011 at the high-end. 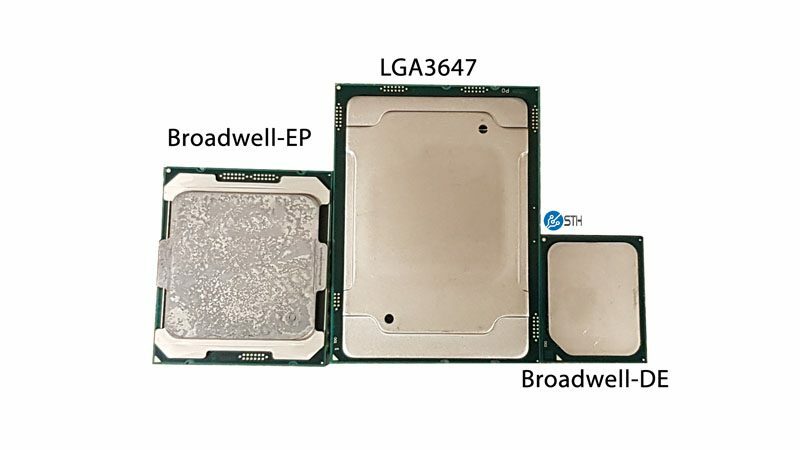 As with LGA 2011 where there are variants such as LGA 2011, LGA 2011-2 and LGA 2011-3, the Intel LGA 3647 socket will have different sockets with the same number of pins serving different processors. Today we have a Knights Landing socket and wanted to show off how big the new CPU packages are going to be in comparison to today’s chips. If you wanted to see into the future of where chips are going, today is your day. Here is a quick flyover video of the shipping Knights Landing LGA 3647 socket. You can see it is flanked by six DDR4 DIMMs which allow Knights Landing CPUs to handle up to six DDR4 channels. LGA 2011-3 CPUs, in contrast, have four DDR4 memory channels per CPU. This is very different than a NVIDIA or AMD GPU where the multi-core processor uses a host CPU’s memory controller for RAM access. We did want to provide some perspective. 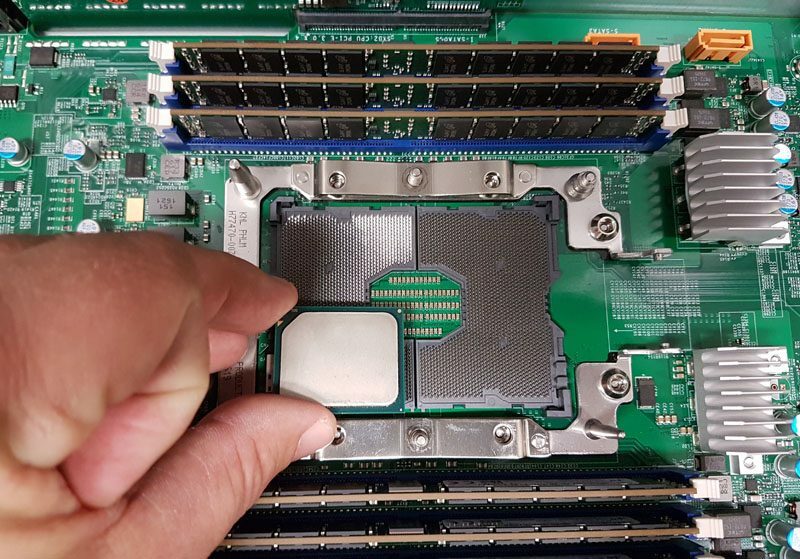 Although we did not have Intel Xeon E3 series processors in the lab (quite telling since we now have over 200 nodes in our data center lab), we did have some other interesting comparison points. As you can see, the difference is massive. We will note, the three packages shown were not supplied by Supermicro however the company did supply our test server. Unlike the LGA 2011 (V1, V2 and V3 series) system of dual latches, that methodology has been re-designed for LGA 3647. The socket and thermal designs we have seen do not have latching mechanisms. Instead, we are seeing solutions that secure the CPU to the heatsink. Then the entire assembly is guided into place by the socket’s guide pins. Finally screws are used to secure the assembly in place. 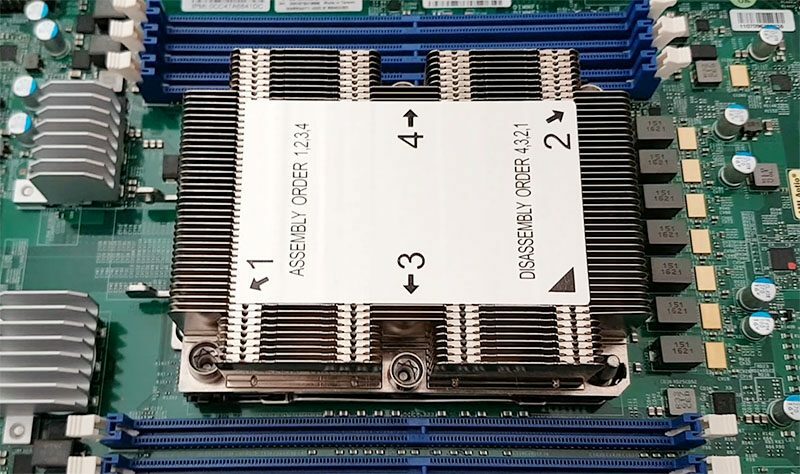 Here are the screw down instructions for the Supermicro 2U4N solution’s heatsinks that have to deal with well over 200w TDP in a 1U high chassis. As you can see, steps are significantly more complex than with the latches we are accustomed to. We are not as fast with the new coolers as we were with LGA 2011 however that may be the difference of a few thousand LGA 2011 cooler installations under our belt. The Intel LGA 3647 socket is monstrous and is roughly four times the size of an Intel Xeon D package. 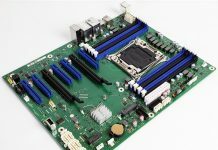 There is going to be a major shift in how these processors need to be handled as the sheer weight of the LGA 3647 package is enormous compared to current offerings. The flip side to this socket, as we look to Skylake-E(P) parts is that it takes a significant amount of real estate. We are unlikely to see this socket flanked by a full compliment of 6x DDR4 DIMM slots on any mITX motherboard as we did with the LGA2011-3 generation. Frankly, even mATX would be cramped with the new chips. For desktop users, the LGA 3647 socket is massive overkill. As we move to Skylake-EP generations of CPUs, some of the traditional four nodes in 2U designs will still be possible but they are certainly more cramped than with older generation CPUs. We do like the new six channel memory controller onboard these CPUs. Intel® Xeon Phi™ Product Family x200 -> up tp 72 core @260W !! 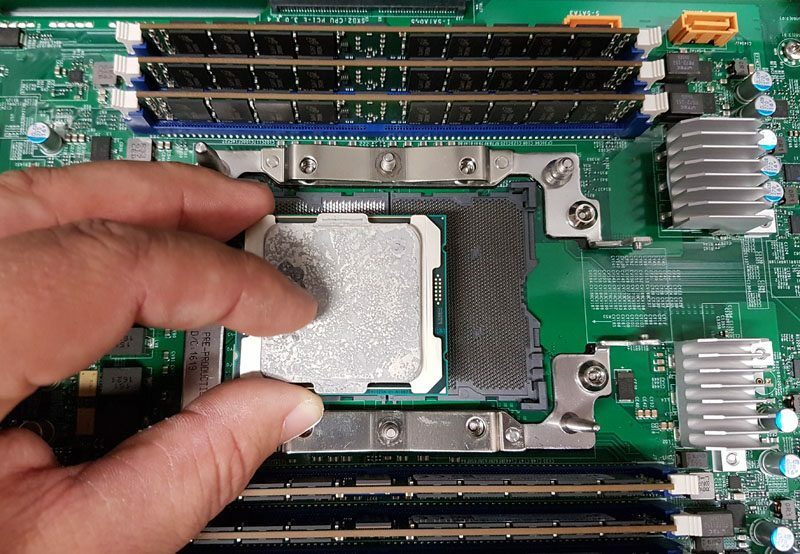 call me naive if you want, but by briefly looking at the first picture, I thought that the new processor size was the quarter of the whole socket’s, and that the socket would accept from 1 to 4 CPUs as desired, leading to an easy upgrade path :). I was wrong, but wouldn’t it be a nice feature ? These are for the newer generation multi-core processors. That socket is for a signle package.